Using drag and drop layout manager for home page, You can show or hide and arrange home page modules in any order you want. 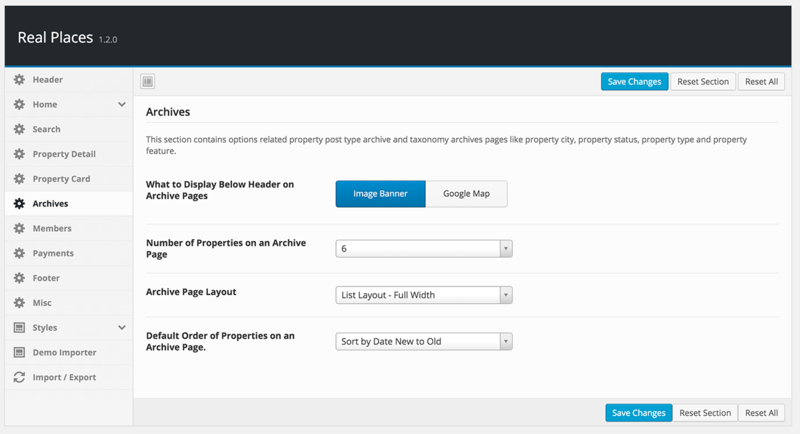 You can also use wpbakery page builder in home page contents module to add custom contents to home page. This theme includes Google reCAPTCHA to prevent spam message. 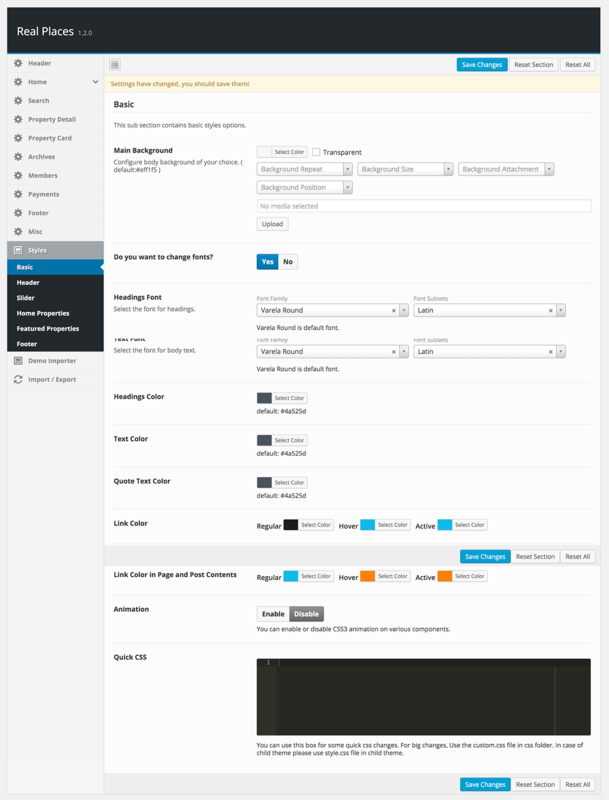 This theme includes basic support for dsIDXpress plugin. A real estate property is like a post in WordPress and You need to simply create users for your agents with author role. You can know more about roles from https://codex.wordpress.org/Roles_and_Capabilities . 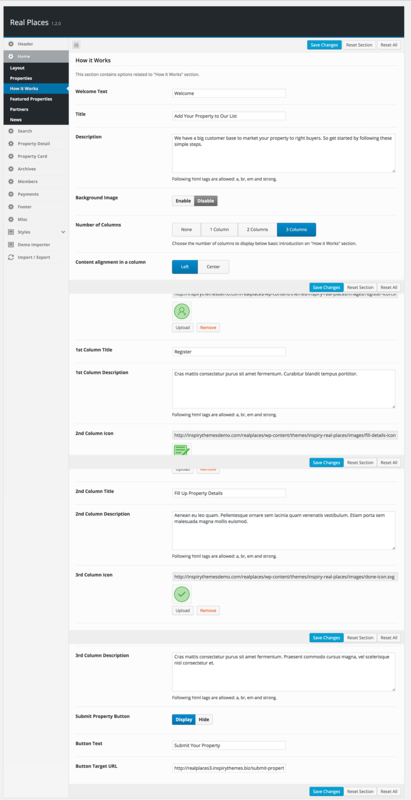 So, You do not need to enable registration for public and manually added users with author role will be good enough to add properties using WordPress dashboard. You can forward documentation’s add property link to your agents for guidance. 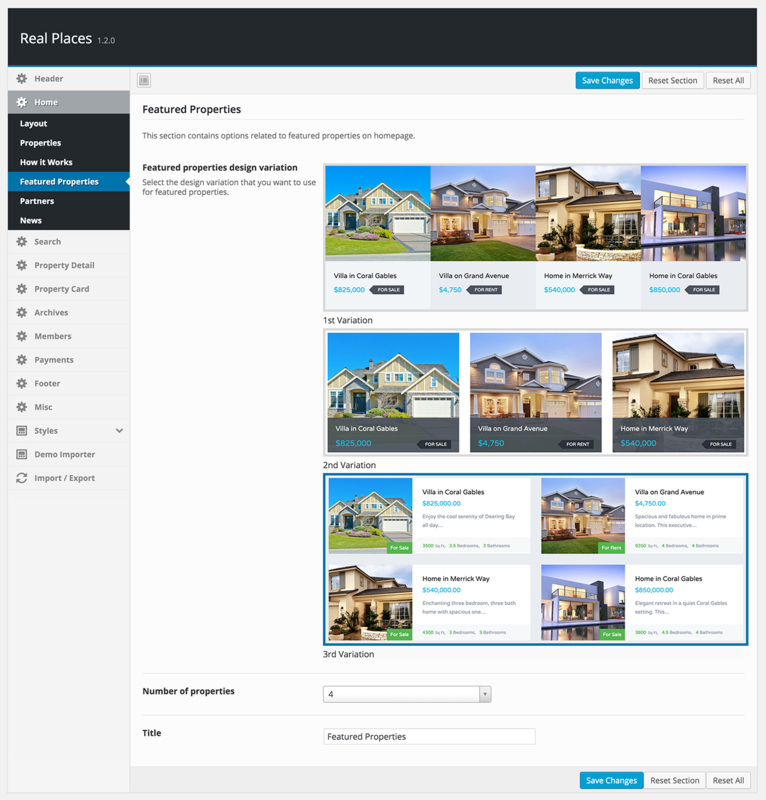 You can import properties into Real Places theme for free using WP ALL Import plugin and it’s add-on for Real Places theme. For more details you can consult this knowledge base article. How the dsIDXpress plugin works with this theme ? 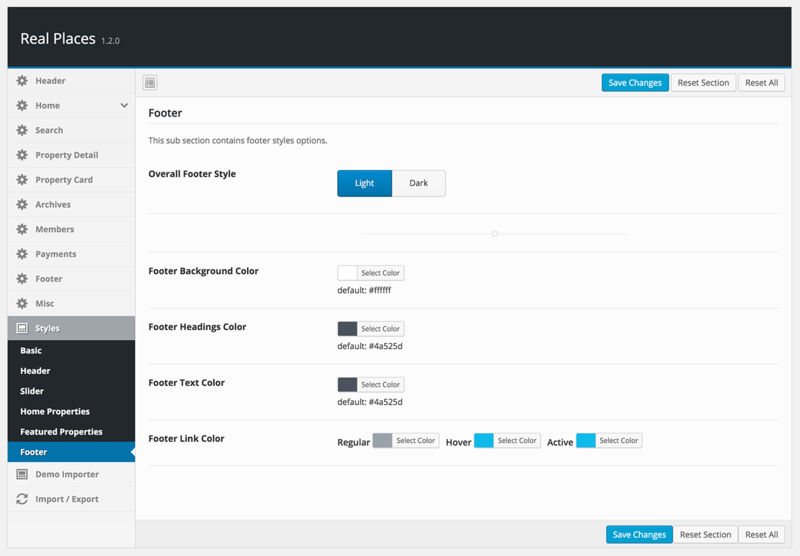 This theme supports dsIDXpress plugin as an additional feature . So, it is a complete theme even without dsIDXpress plugin and that plugin is not required for this theme’s basic functionality. 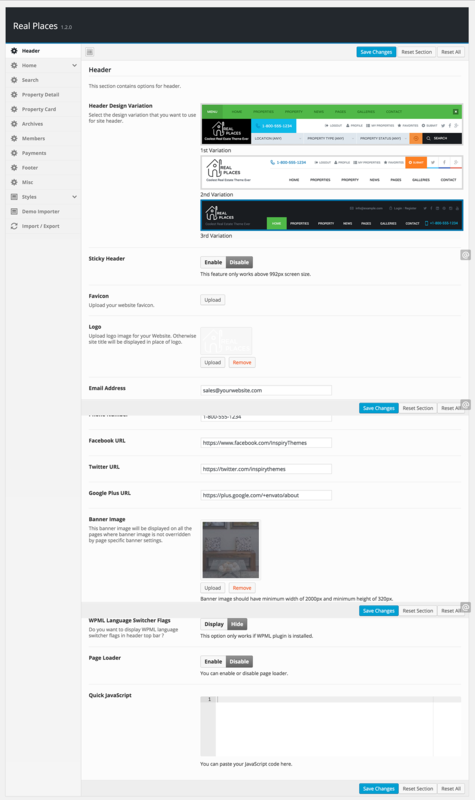 Please check out screenshots to understand what this theme offers without dsIDXpress plugin. 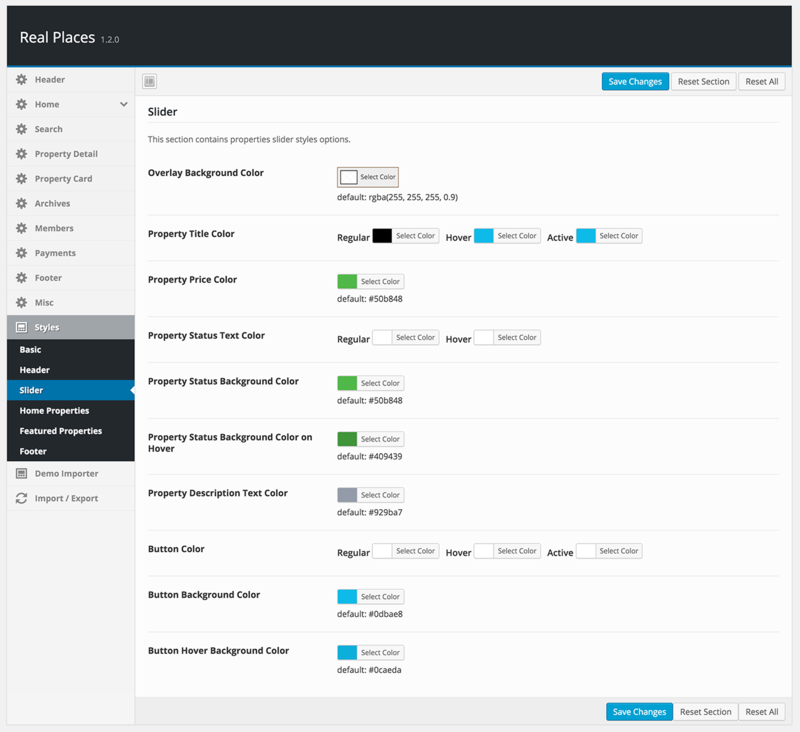 You can add, modify, remove, search and list properties with the basic features of this theme and without any extra plugin. Easy and Extensive Theme Options ? For more information you can view screenshots. Google reCAPTCHA Support ? For all the forms in this theme. Advance Properties Search Form ? Any search field can be enabled or disabled from theme options. You can also ordered the fields from theme options. Edit Profile ? User can modify his profile information and upload his profile image using front end profile page. 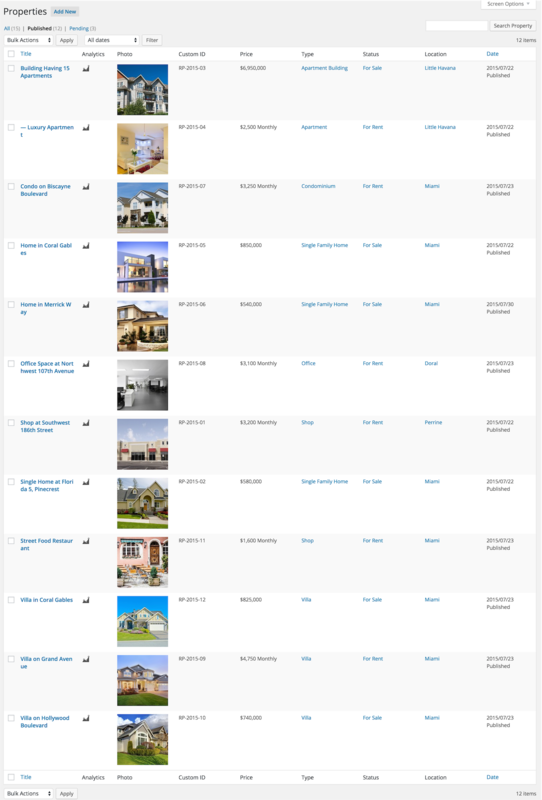 View Favorites Properties ? User can add/remove a property to favorites and view his favorites properties. Front End Property Submit ? User can submit property from front end. List Submitted Properties ? User can view list of properties that he has submitted. Edit Submitted Property ? User can modify any of his submitted property. PayPal Payment for Submitted Property ? 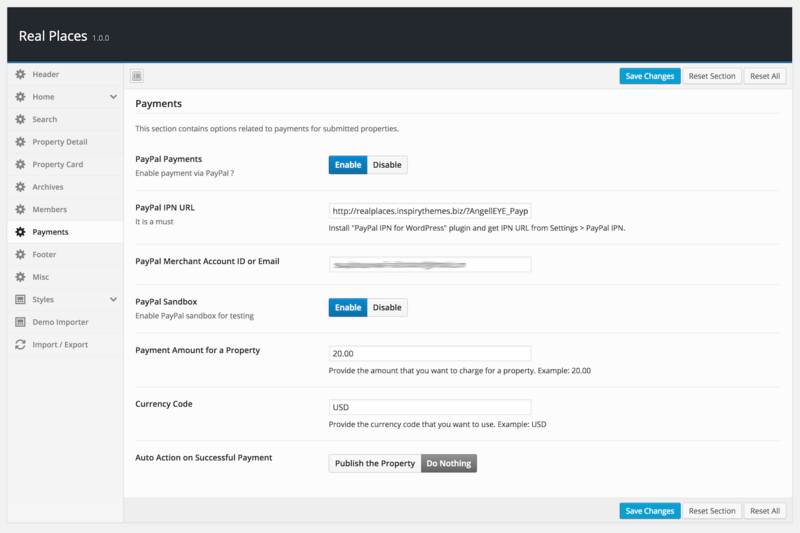 User can pay for his submitted property using PayPal and if enabled from theme options that property will be published automatically on successful payment. Administrator can View List of Payments ? To take any further action after successful payment. 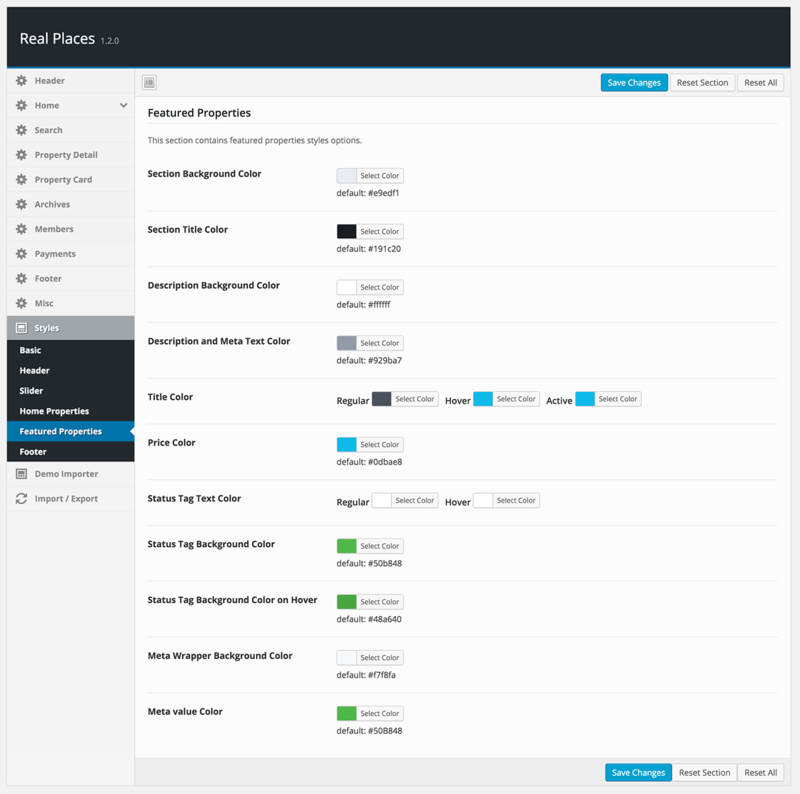 Three variations of header area are available and those can be switched easily from theme options. Note: You can use any module from available variations at any order you want. Overall this theme offers following modules on homepage. Properties Module – 2 Variation Available – You can filter these properties to display them from any status, location or type. You can also change other settings like number of properties to display etc. Check theme’s screenshots for further details. How It Works Module – Various settings related to this section are available in theme options. Featured Properties Module – 3 Variations Available – You can also change related settings from theme options. 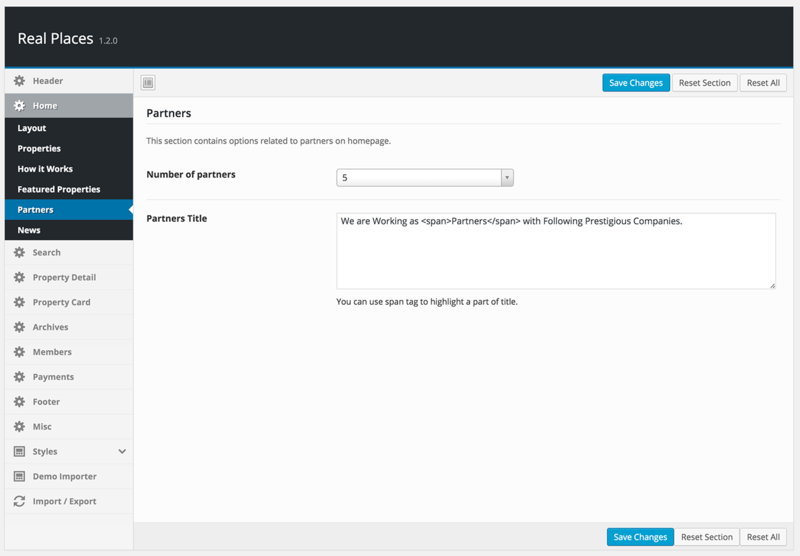 Partners – Related settings can be modified from theme options. 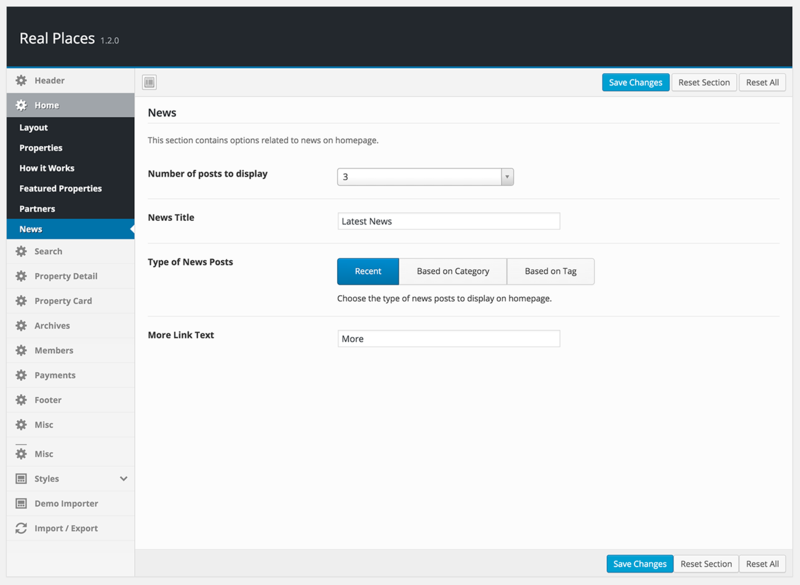 News / Blogs Posts – Related settings can be configured from theme options. Support to add Featured Properties Widget OR any other type of widget. Agent Detail Page ? To display detailed information about agent and related properties list. User / Author Detail Page ? To display detailed information about user and related properties list. Contact Template ? 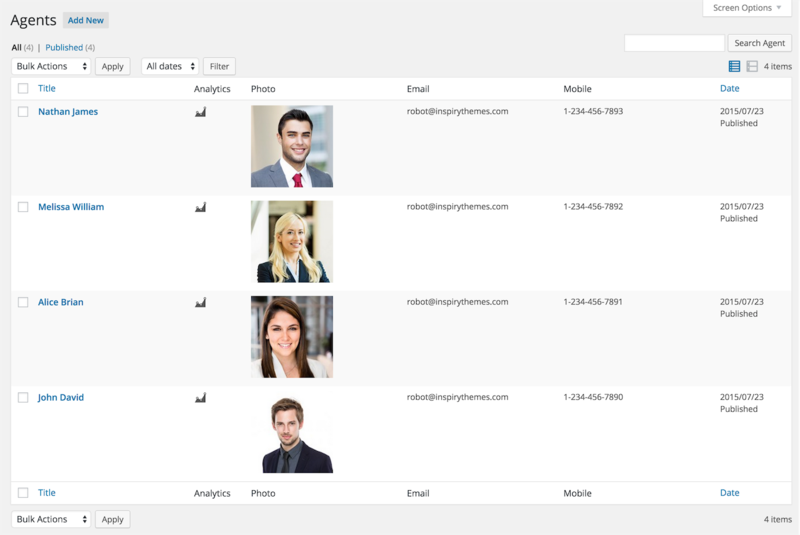 With Ajax based contact form, Google reCAPTCHA, Google map and other contact information. Thanks for purchasing Real Places Theme. We truly appreciate it! Support for all our themes is provided through our support website. 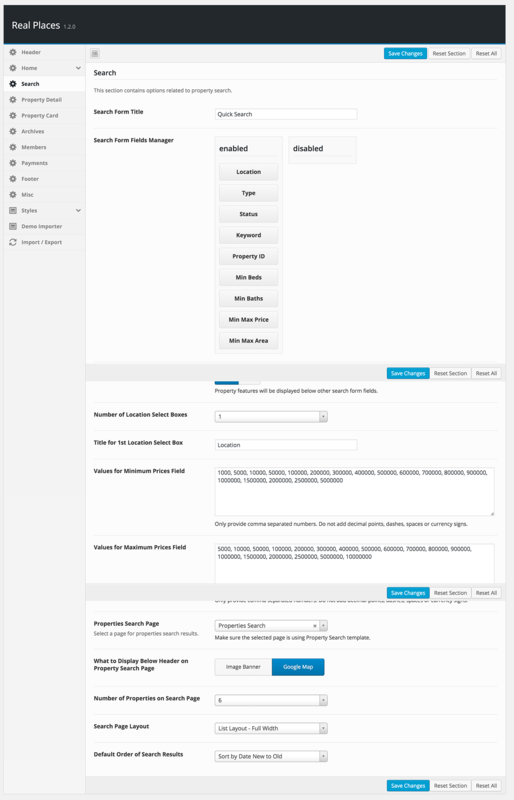 Refactored overall code to full fill Envato’s latest WordPress theme requirements. Included plugin named “Inspiry Real Estate” got major code changes to cover plugin territory functionality. Also included Gutenberg support to cover default Gutenberg blocks. 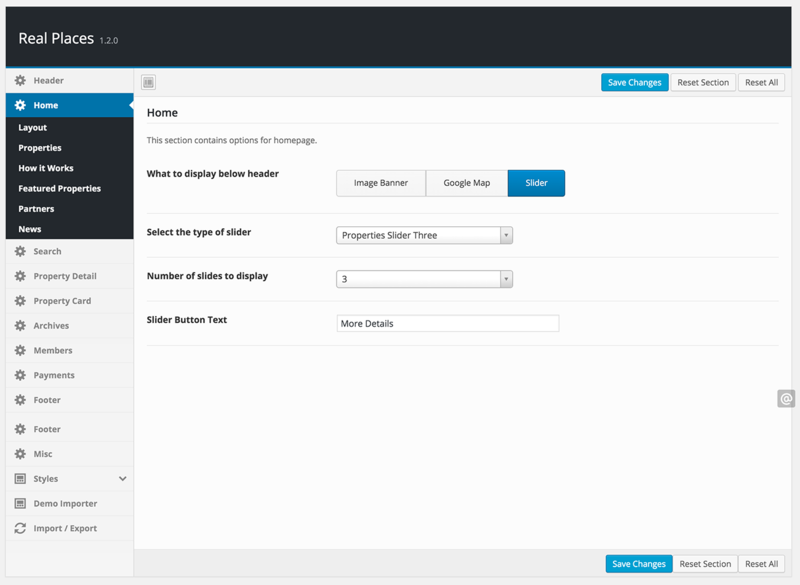 Updated Revolution Slider and Visual Composer plugins. 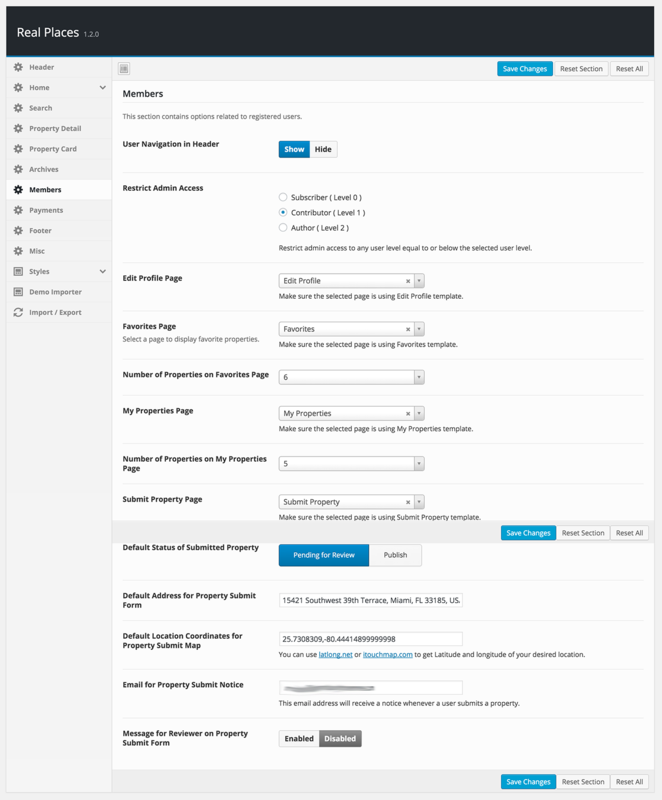 Tested and Improved for WordPress 5.0. Improved compatibility with older versions of PHP. Added option to sort taxonomy terms in advance search form. Added machine translated Spanish, French, German, Italian, Portuguese and Turkish language files. Improved validation for front end property submit and edit page. Improved front end property edit page title. Improved dropdown select box styles. Fixed social icons bug for 2nd header. Fixed mark this property featured issue on property edit page. Added GDPR agreement checkbox support for all contact forms. Added compare properties support for taxonomy archive page. Improved styles and fixed some styling bugs. Added pattern based auto generated property ID support for front end submission. Added year built field in property meta. Added next and previous navigation support for property and blog posts. Improved meta boxes appearance and backend code. Fixed conflict with contact form 7’s recaptcha. Fixed title related bug for featured properties on homepage. Fixed header styles bug in theme options. Fixed various other issues and improved code. Improved and Updated Inspiry Real Estate plugin. 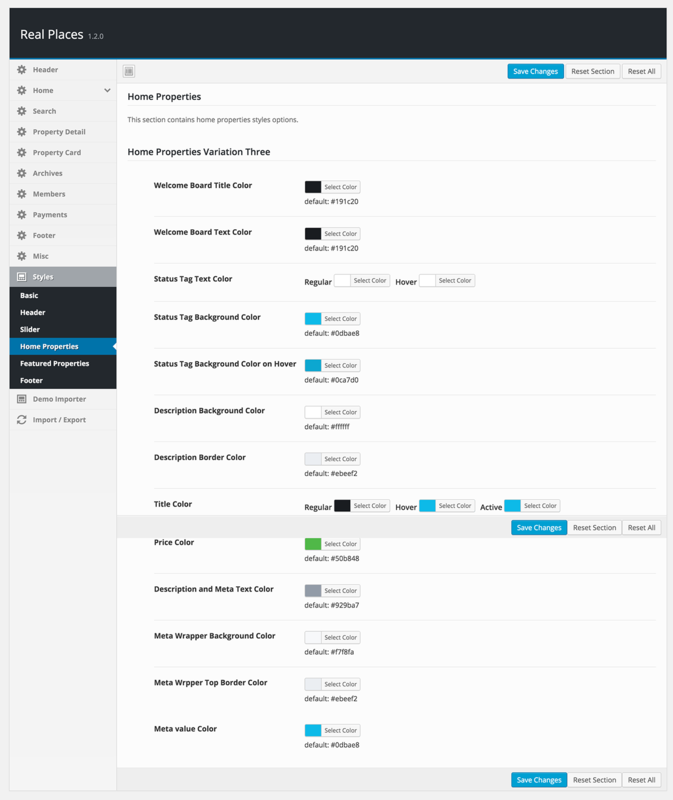 Updated Visual Composer and Revolution Slider plugins within the package. Added a filter hook name real_places_post_status for publish status on my properties template. 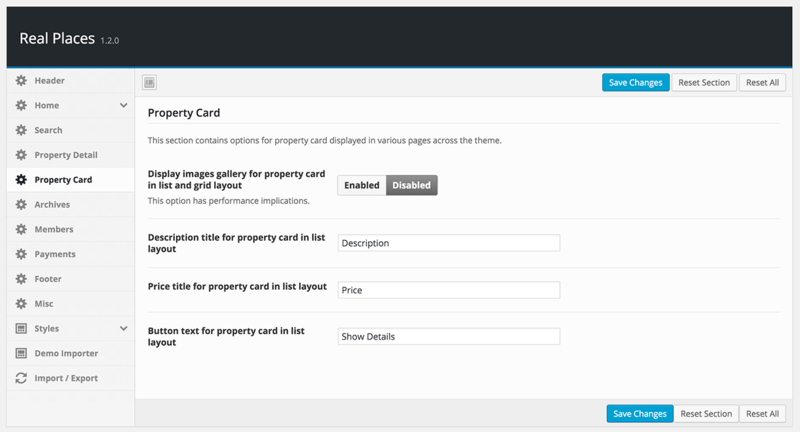 Fixed empty gallery entry issue for gallery template in case a property does not have featured image. Fixed missing map marker issue on single property when multiple property types are assigned. Improved checks to display price on list template with sidebar. Updated Inspiry Real Estate plugin. Added separate Min & Max Prices support for Rent properties in Advance Search form. Added BCC ( Blind Carbon Copy ) support for the Agent contact forms. Added several new social icons support for header. Added ( List Layout with Sidebar) and ( Grid Layout with Sidebar ) support for search results page. Added properties shortcode. This shortcode is also compatible with Visual Composer. Fixed some minor style issues. 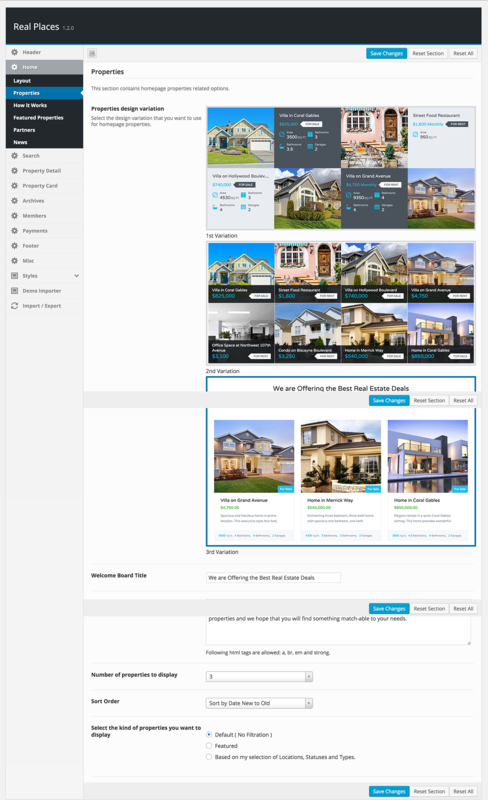 Added homepage properties 4th variation. 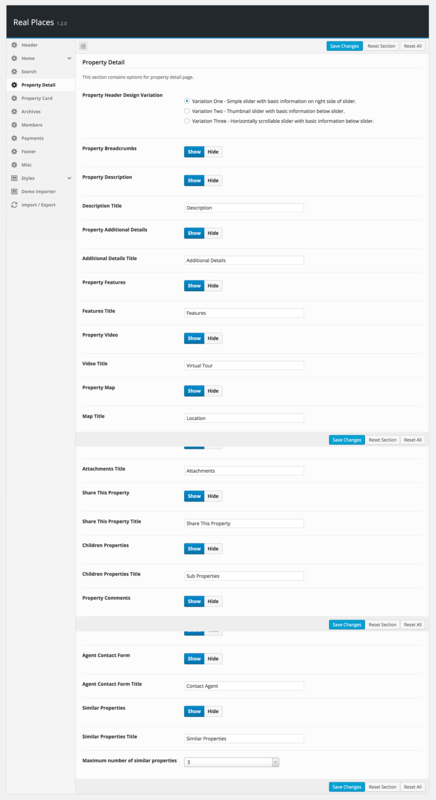 Added page content support for properties list & grid templates. Added contact number field to agent’s contact forms. Added pagination support for gallery templates. Improve pagination support for homepage. Updated & Improved included plugins. Improved archive page description tag. Improved property detail slider’s 3rd variation. 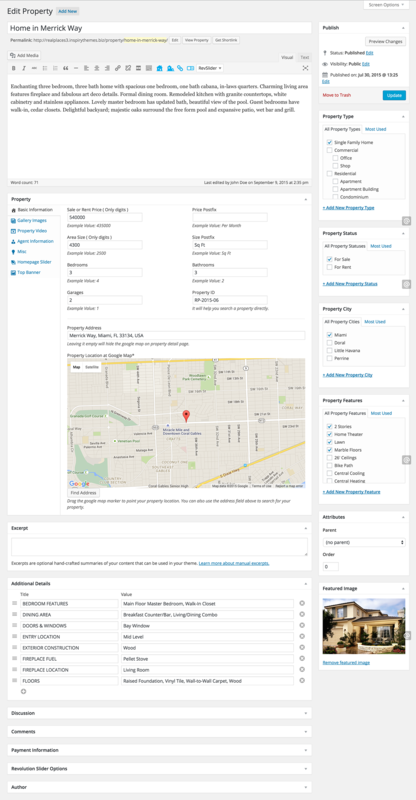 Added iframe support in front end property submit form to help users included embed codes for virtual tours and videos. Improved user registration flow by emailing registered user’s randomly generated password to his email address. So user can only login if he provides a valid email address. Added multiple agents support for a property. Improved reCAPTCHA code to make it work with multiple agents. Improved mailing code in the overall theme to make emails more authentic by having correct from and reply-to email addresses. Added property URL to share it via email. Improved the overall code and increased the text length for email sharing. Fixed dropdown styles for responsive mortgage calculator widget. Fixed horizontal scroll issue when dropdown is opened. 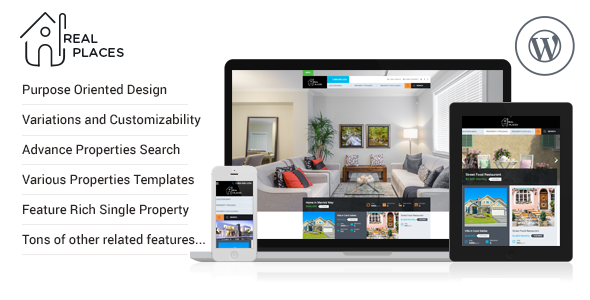 Updated Inspiry Real Estate Plugin ( Version 1.2.0 ) included as part of theme to match with latest updates. Added various other code related improvements. Added new revolution slider design for Real Places. 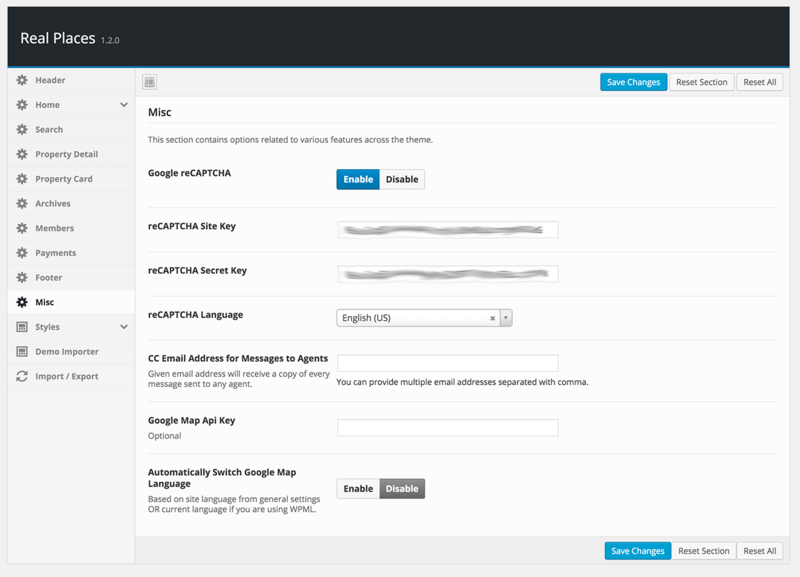 Added functionality to restrict admin access for certain level of users. User level to restrict can be changed from theme options. Added property type taxonomy support in breadcrumbs for property detail page. Improved overall logic to display image banner, Google map and slider revolution. Updated Slider Revolution plugin to latest version. Added comments support on property detail page. 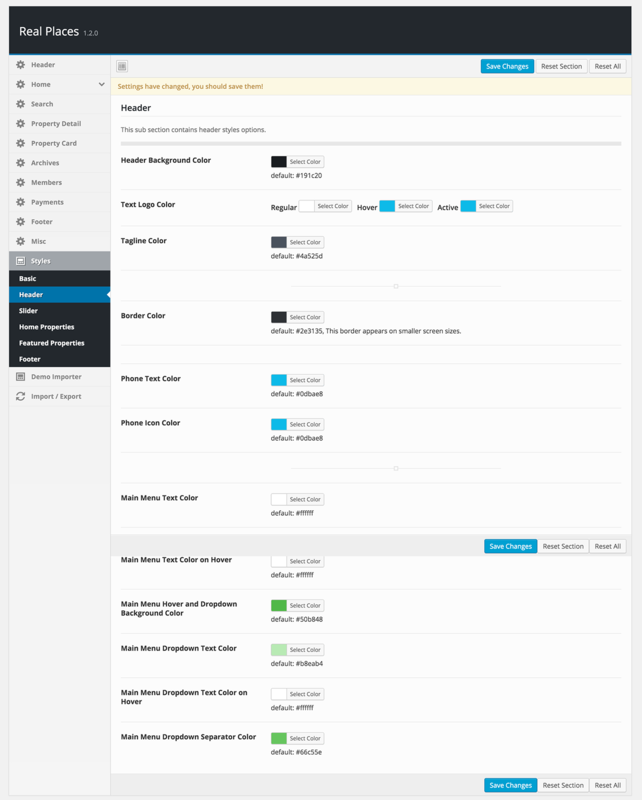 Updated theme screenshots to help buyers view the admin side before purchase.